A village Rasulpur Mafi in Amroha district of Uttar Pradesh is not happy with BJP governments both at Uttar Pradesh and at the centre. 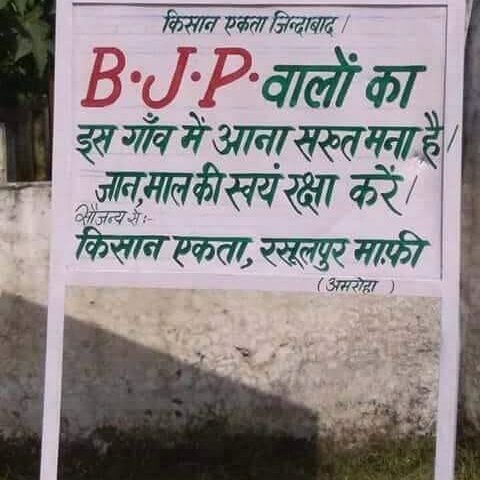 People of the village have expressed their angst by erecting the board outside the village which says BJP not allowed in the village. The way the Centre treated farmers during Kisan Kranti Yatra at Delhi – UP border should be a cause of worry for both PM Modi and CM Yogi. The action of attacking farmers with tear gas and water cannons has not been liked by farmers who have been peaceful right through the march from Haridwar to Kisan Ghat. This photo is viral on social media.